September 2 storm: End of summer 2015? Since the barometer bottomed out Saturday (August 29), and this massive system moves on, we catch the tail end with a thunderous display and torrential downpours, that, as usual, catches me unprepared with a hole in the roof and bad gutters. Environment Canada’s site did not have any advisories posted. The station at Victoria airport, 2.6 km away, indicated rain showers and possible thunderstorms. It was nothing like what I experienced. A seething black wall of clouds advanced from the Cowichan Valley, sweeping over the Saanich Peninsula, with a series of deluges following. In the aftermath the storm sewer outlets blasted the beach like fire hoses. After Saturday’s strong Sou’easter (making national news), Surfside Bay is jammed with windrows of seaweed. The storm coincided with the arrival of the first aggregation (26) of Heerman’s Gulls on their usual autumn roost, accompanied by a number of Black-bellied Plovers. I was caught out in the first deluge this morning, with binoculars, negotiating the slippery beach with my dog. 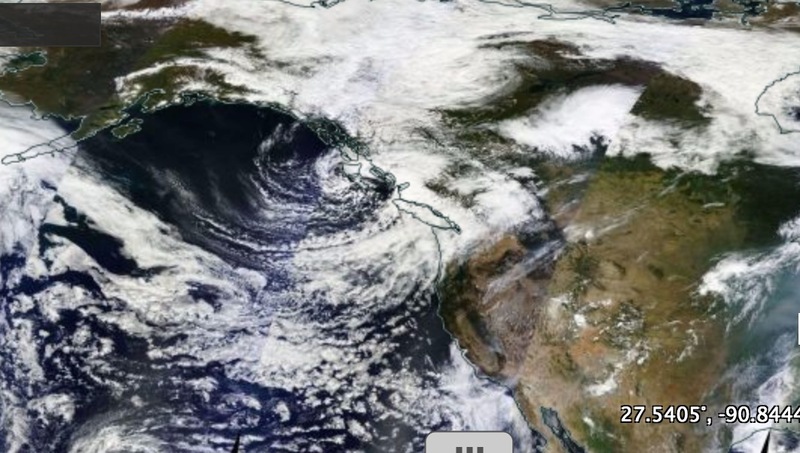 Yesterday’s satellite image from NASA shows this first major ‘comma-cloud’ formation, clearing the air over a vast area of the Gulf of Alaska. The National Centers for Environmental Prediction charts ( http://wxmaps.org/pix/hemi.00hr.html) indicated that there was a heightened CAPE (Convective Available Potential Energy), with a bullseye centre situated just off the coast of Vancouver Island. As with the last significant display of thunder, lightening and downpours in April, these localized features are difficult to forecast. In passing, they remind us how poorly prepared we are for real calamities. So far the long term climatic forecast for the onset of a stormy autumn are proving true. One of the longest, most glorious summers on the coast may have ended abruptly.